Emerging from the Wall Street subway stop, it is easy to fall into step with foot traffic flowing toward Liberty Park. 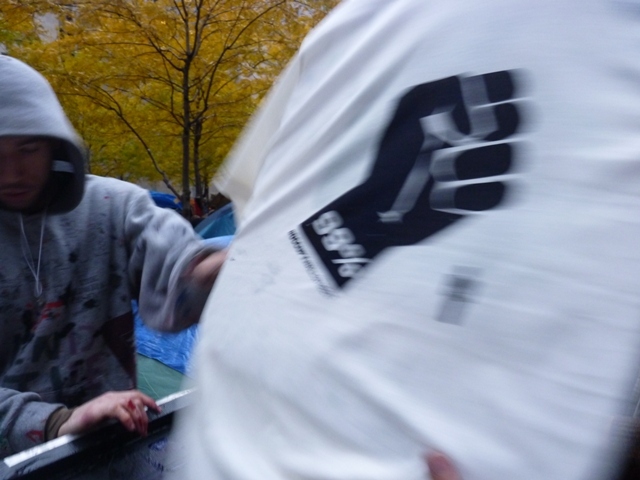 It is near dusk on November 13, 2011, two days before the late night raid that would effectively sweep the park clean. There is no news this day, no clashes to mark the media map, just the daily buzz of this happenstance “zone of dissent.” The Occupy Wall Street protesters, herded here on September 17 in the NYPD effort to stop them from stopping business as usual, fell into this space, a publicly-held private park, and falling in through its zoning loophole became inhabitants. 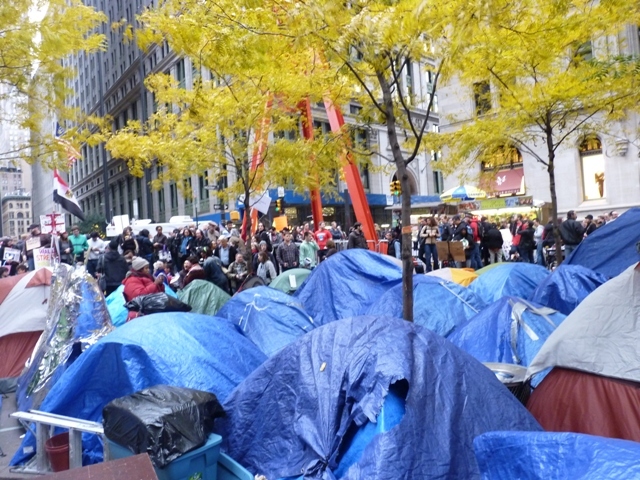 Most photos and camera footage of the encampment affect a sense of chaos amidst disparate concerted pockets of activity. Shaking, short-sweeping pans across tops of crowds, hasty zooms into a tangle of bodies. Those images we won’t forget: YELL, the young peppersprayed woman kneeling on the ground screaming in anguish, jutting one hand out like a person falling, the other hand protecting her already-burning face – the iconic image of protest plus brutality. In the image from Kent State, a 14-year old runaway kneels similarly over a dead body. Look past the single image into the tangle of bodies. 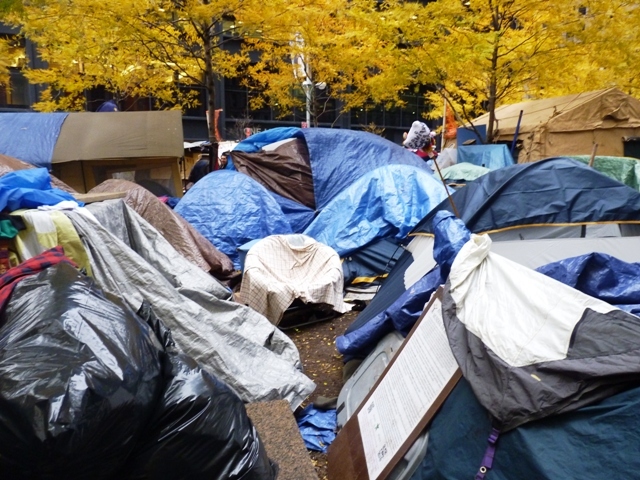 In contrast to the financial sector workspaces that surround and enclose it, the encampment is remarkably porous: unguarded, transparent, and open. 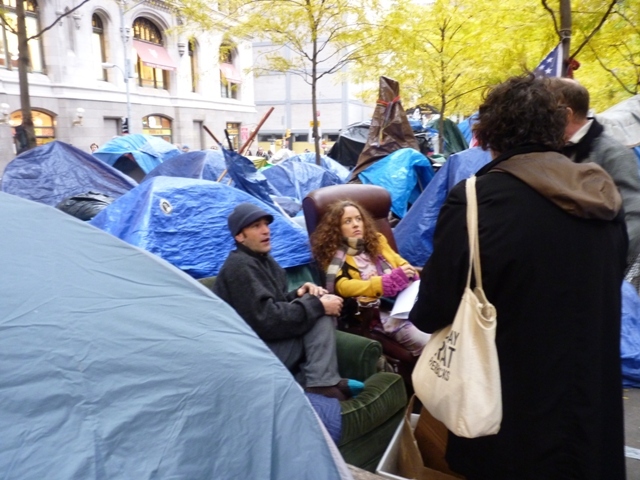 Hundreds of protestors inhabiting – sleeping in, waking in, being in. Storing, sorting through possessions. Gathering for yoga at dusk. 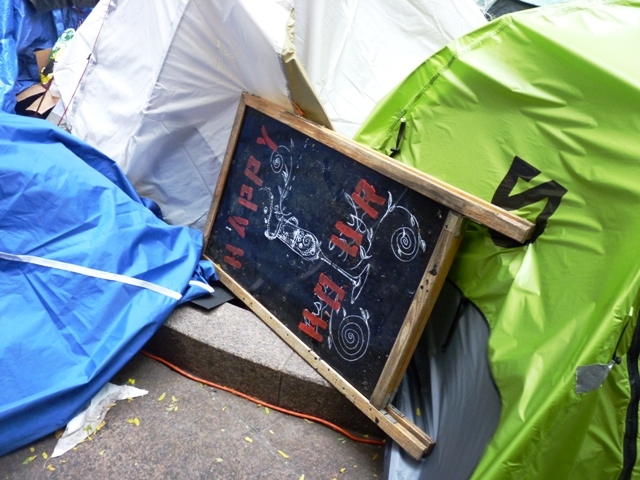 Before someone thought to become less transient and set up a tent, there were air mattresses and sleeping bags scattered about, people sleeping openly on the ground. Private life publicly lived. It’s easy to eavesdrop, to join in on a conversation. A public space put to public use, held open by a couple in conversations with passers-by while seated in a living room chair. It’s easy to see how the porous encampment is comprised of interlocking social and economic systems. 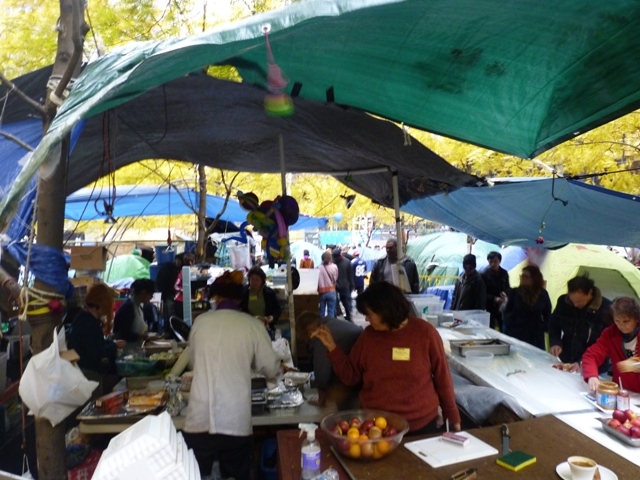 Various vendors – of pretzels and hot dogs, “Occupy” buttons and t-shirts, political literature – are situated around the perimeter of the park, while a coherent infrastructure creates an interior: central “areas” and “units” provide media coverage, medical treatment, reading materials, sanitation, and counseling; meals, it seems, are constantly prepared and food dispersed; and there is an open-air shrine, situated adjacent to a cluster of tents, situated adjacent to a performance area, where people, it seems, are constantly drumming. It is easy to eat a meal here. A local politics enacted. 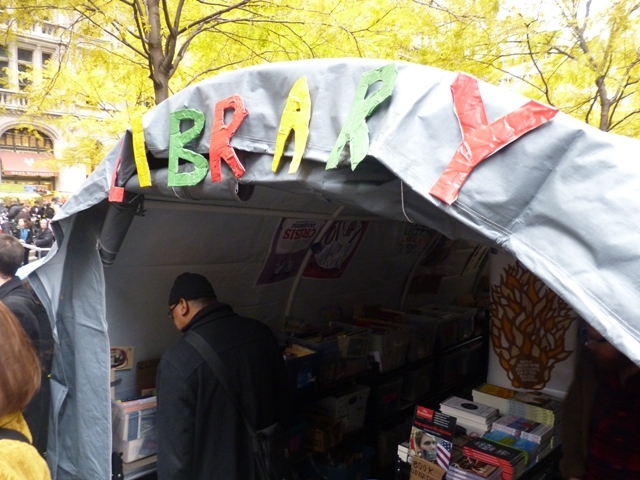 The Library holds over 5000 books in a shelter donated by Patti Smith. “It’s important to recognize it was the library for that part of the city,” where there was no library, much less a book store.1 Donated books are constantly being browsed and selected. Library workers, it seems, catalogue materials constantly. 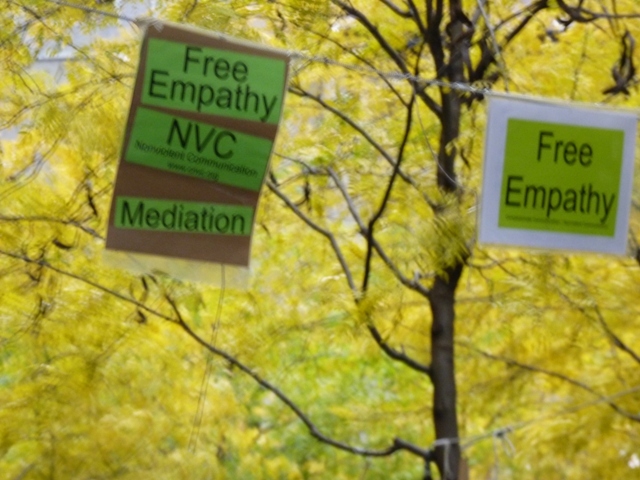 A local politics is enacted in the imaginative geography of various “plazas” for teach-ins, multi-faith services, and the gathering of the general assembly. At the same time, we can imagine links to global trajectories – to the Arab Spring and various European Occupy movements. 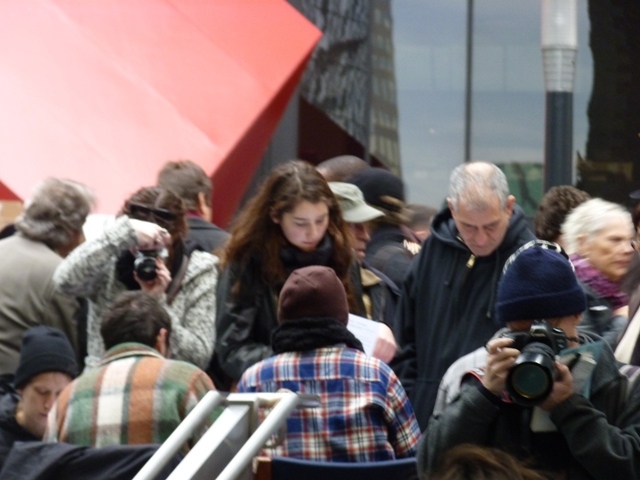 The event of this place overflowing the happenstance physical boundaries of Zuccotti Park. Its renaming as Liberty Park signals the permeability of these boundaries. Encourages the flow of traffic. It’s easy to wend your way along the small thoroughfares, amongst the temporary domiciles. A multi-minded geography is one many can enter and traverse. 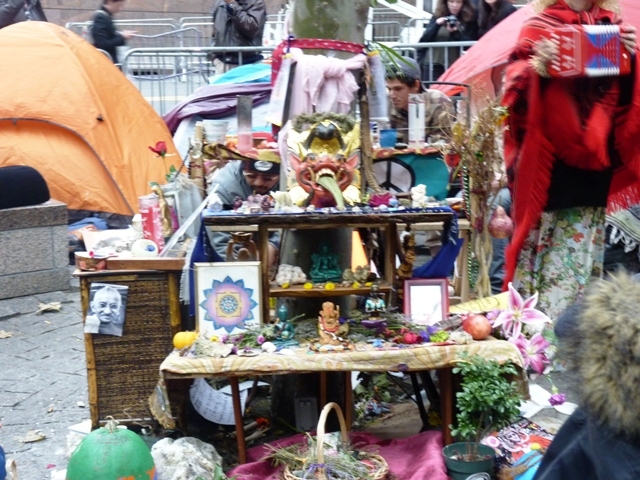 Unlike the nearby architectures designed to generate and protect capital, it is multi-specialist and inclusive and invites simultaneous organizing, nourishing, resting, creating, protesting, meditating, singing, being. OWS was motivated by a demand for greater transparency and accountability on the part of an industry driven to the brink by financial models few understood. The encampment’s status as a public space echoes this demand. 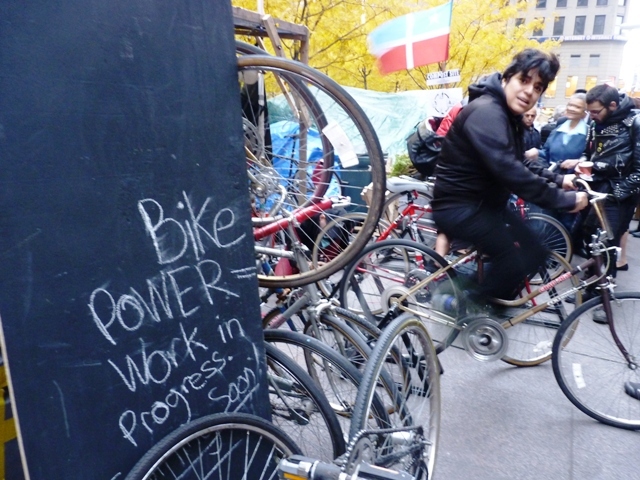 The occupation of occupations in the impromptu “industries” enacted here repairs temporarily the economic policies and inequities that motivate OWS. This alternate state returns to the root of economics, to oikos, “home making,” the making of a place suitable for human inhabitance. All these activities together enacting a variously-nuanced critique. And providing fuel for the spirit. Hare Krishnas, for whom singing is an occupation, situate themselves in the shrine and commence singing. The porous encampment nurtures multiple imaginative geographies. The dispersal and return of protestors to coincides with the opening and closing bells of Wall Street. Exhales and inhales of the occupation of occupation. In the parlance of the state, the most ready analogy is to those “territories” that are claimed as possessions by “occupying” nations. 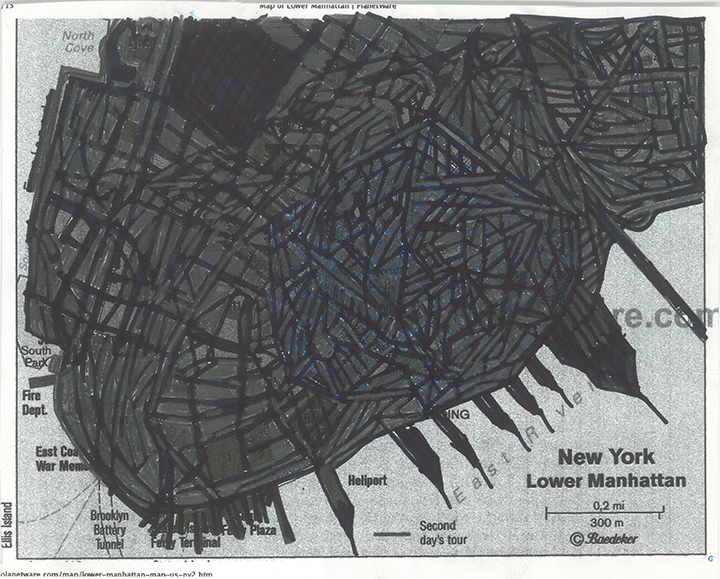 “Liberty Park” – a patch of real estate “at the heart of the empire”2 – suggests the claiming of a territory. If it’s not military, what kind of occupation is this? 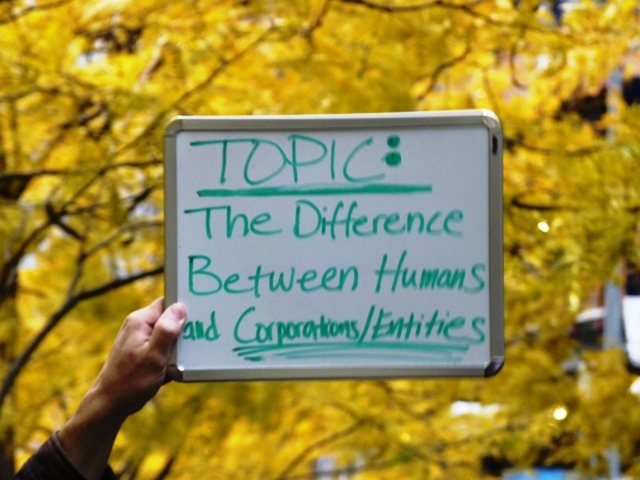 It’s easy to see an alternative form of governance being enacted. An alternative organization of social relations, power relations, economic relations, all those relations that elevate a place to the status of a state, are here variously manifested. Those living at and visiting Liberty Park contribute to its commerce – in goods (always by donation), in ideas, in camaraderie – and contribute to the construction of an alternate state within a state. A structure within a structure within the glassed-in walls of those structures that mark this urban district as devoted to the life of capital. It’s an occupation of occupations. From some locations inside the park, a fringe of small trees marks the perimeter and leaves screen out the street. Zooming in, it looks like a group campsite in the woods. Zooming out, the glass edifices are vibrating. As in a large arena, the drumming echoes off the buildings. As in a large arena, one loses sight of the sky. 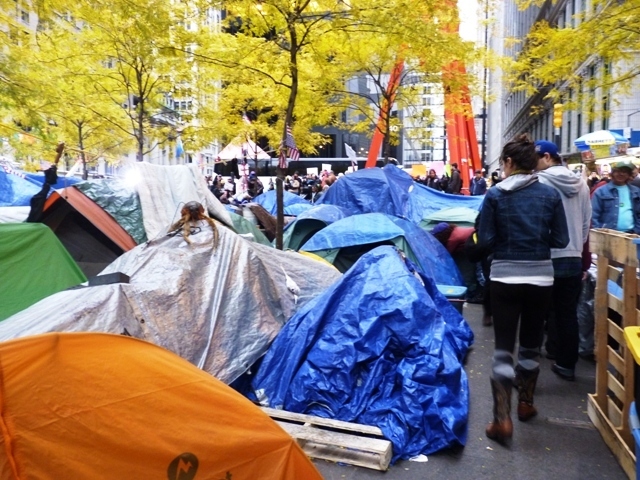 On Tuesday, October 13, 2011, owners Brookfield Office Properties had announced plans to close park on Friday for cleaning and posted new rules banning, among a few other things, CAMPING AND/OR THE ERECTION OF TENTS OR OTHER STRUCTURES; LYING DOWN ON THE GROUND, OR LYING DOWN ON BENCHES, SITTING AREAS OR WALKWAYS WHICH UNREASONABLY INTERFERES WITH THE USE OF BENCHES, SITTING AREAS OR WALKWAYS BY OTHERS; THE PLACEMENT OF TARPS OR SLEEPING BAGS OR OTHER COVERING ON THE PROPERTY; STORAGE OR PLACEMENT OF PERSONAL PROPERTY ON THE GROUND, BENCHES, SITTING AREAS OR WALKWAYS WHICH UNREASONABLY INTERFERES WITH THE USE OF SUCH AREAS BY OTHERS. In response, the encampment inhabitants allocated $3,000 from their treasury to purchase supplies and commenced cleaning in advance of the anticipated inspectors. 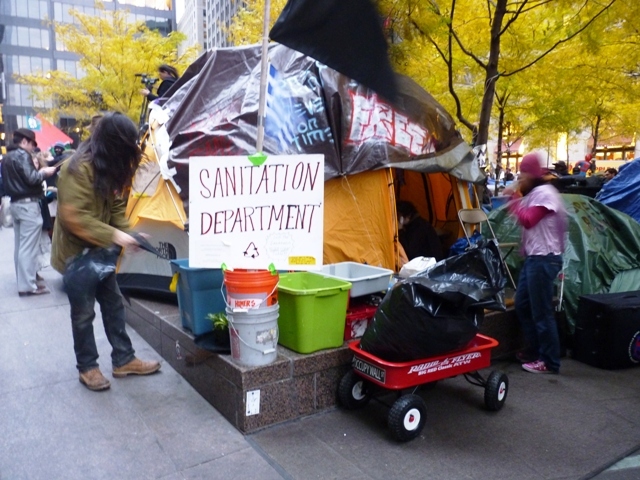 The Sanitation Working Group communicated to Brookfield Properties through their lawyer out of their desire to “prevent [sanitation] issues from creating a pretext for police action in violation of our client’s First Amendment rights to utilize the Park.” They provided a report on their current cleaning efforts (which included “typically […] between one and fifteen people sweeping the Park with brooms at any given time”5) and a four-point sanitation plan with stepped-up garbage removal, the scrubbing, polishing, and power-washing of hard surfaces, and the removal of all items on the ground to facilitate “thorough cleaning.” Soon after, Mayor Bloomberg’s Office had responded that the encampment would be allowed to remain intact and exercise First Amendment rights provided section-by-section cleaning proceeded as planned. 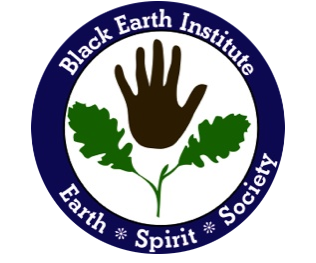 At Breitenbush Hot Springs, a retreat center operated by a communally-organized eco-village in the Cascades Mountains of Oregon, they call this the Cleaning Arts. Here, several collectivities convene to produce the social relations that sustain the phenomena knows as “Wall Street” and “Occupy Wall Street.” Place is defined, in part, by belief in it. In Liberty Park, the acts inhabitants perform together reinscribe the financial district as a site of multiple trajectories, multiple stories. 7 They do this by living there, coexisting simultaneously in that space, introducing there a different space-time, a different imagination of the future. 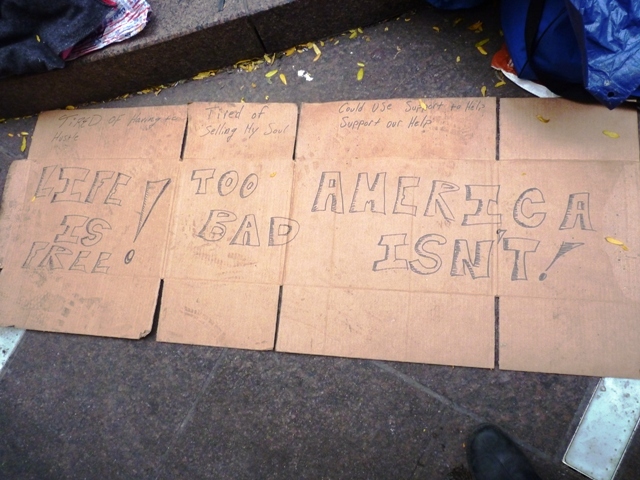 It’s easy to see the alternate narrative of the 99 Percenters inscribed in the sidewalk-galleries of handwritten placards. 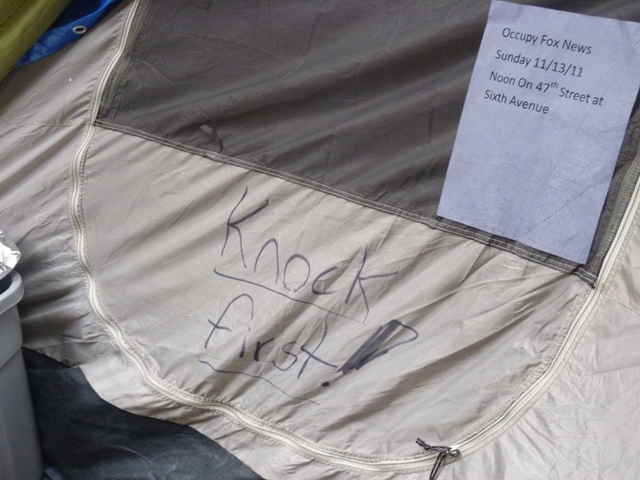 How long can one live in a tent? How long can one publicly inhabit? 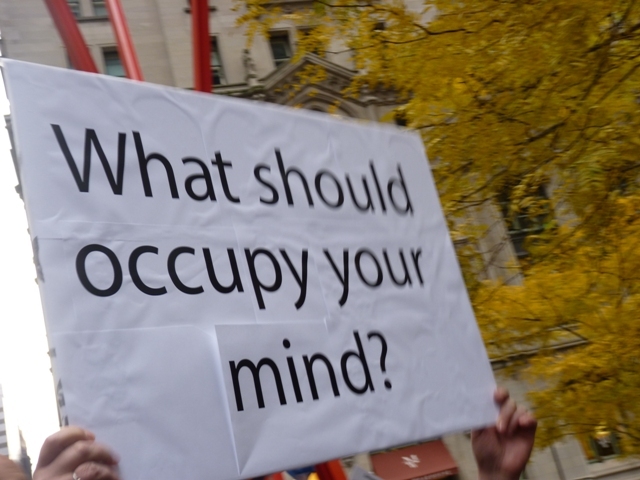 How long can one occupy? The park would soon be repossessed, policed and fenced, shrinking the public life of the privately-held public space. 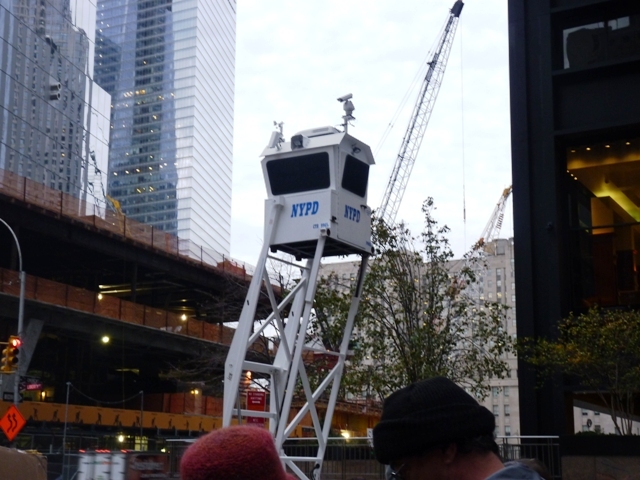 At nearby One World Trade Center, Ground Zero is being reshaped according to its ideology of permanence and progress. 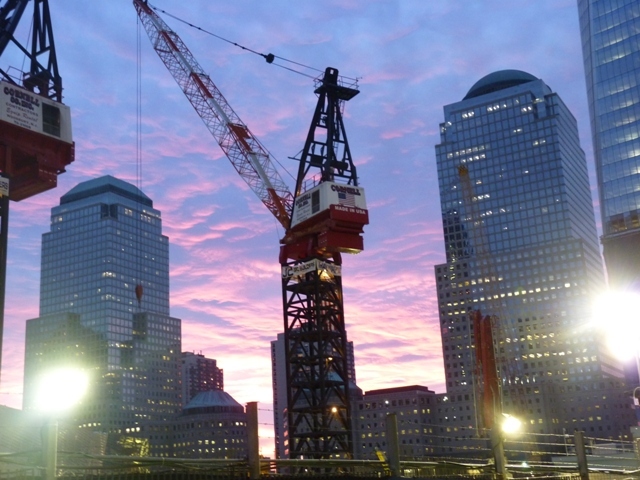 At dusk, a “Made in USA” sign is draped across a now-still crane. Construction is on pause for the night while, as at Liberty Park, floodlights shine brightly. 3 Imagining London by J. Donald, p.142, qtd. Massey, 180. 4 For Space by Doreen Massey, p. 12. 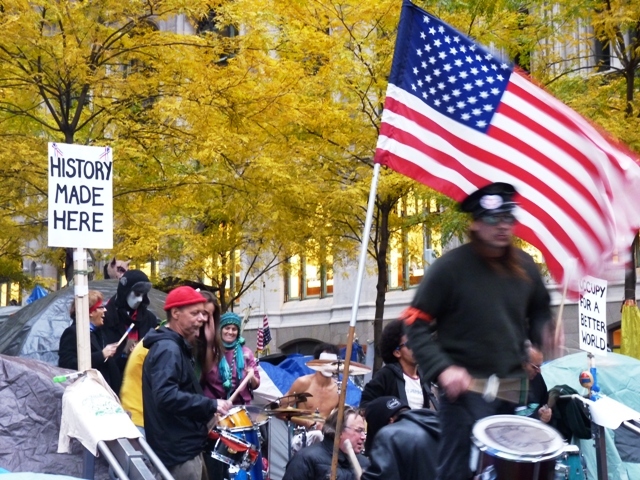 5 These documents were published on Amy Goodman’s Blog, October 13, 2011. 7 This reinscription is literalized in the maps produced to help participants in the OWS anniversary “Day of Action”; these maps divide up the space of lower Manhattan into a “Debt Zone,” a “Education Zone,” and a “99% Zone.” YouTube video, “Walking Tour of Wall St #S16” (10/4/12). Linda Russo is the author of Mirth (Chax Press), a book of poems, and the recipient of fellowships at the Centrum Center for the Arts, the Millay Colony, and her back yard. Poems have more recently appeared in Capitalism Nature Socialism, Horse Less Review, Interim, New American Writing, Shearsman and summerstock. She currently lives in the Columbia River Watershed, where she tends a small plot at Koppel Farm Community Garden and teaches poetry at Washington State University.